Claire Pentecost, Soil-erg, 2015, mixed media, dimensions variable. Lining the vaulted halls and nestled in the bays, chapels, and gardens of Saint John the Divine, a Gothic and Romanesque cathedral with a long history of interfaith services and social justice activism, is a bounty of visual art focused on issues of food security, sustainability, and accessibility. Curated by Kirby Gookin and Robin Kahn, and organized into seven sections—Water, Soil, Seed, Farm, Market, Meal, and Waste—the show reflects the cycle of food production. The mixture of well-known with lesser-known artists, and installations with documentation of past works, reflects the intermingling of art-world visitors with parishioners, pastors, and acolytes. One will immediately notice the more canonical works in the show—a photograph of Walter De Maria’s The New York Earth Room, 1977, a downtown apartment filled with 280,000 pounds of earth, or documentation of Alison Knowles’s 2008 version of Fluxus Event Score: Make a Salad at Tate Modern, in which Knowles poured a cascade of balsamic vinegar into a giant salad mixed in a green tarpaulin by a team of interns, for whomever dared to partake. Such pieces, however, seem ornamental beside more poignant works on display, such as Eating in Public’s Share Seeds Station, 2015, a multitude of seed sharing stations offered free of charge to anyone interested in promoting the time-honored practice of seed saving and sharing, circulating heirloom seeds anarchically through the commons. 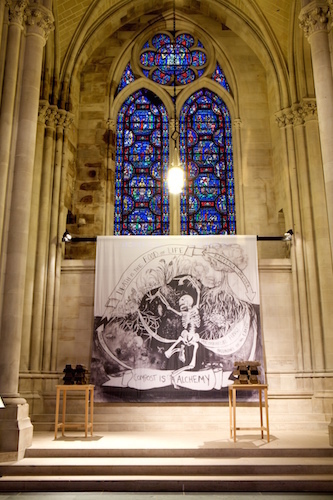 Near the entrance is Claire Pentecost’s Soil-erg, 2015, an imposing, enormous black-and-white tapestry of a skeleton dancing under a layer of topsoil, flanked by soil ingots on wooden tables. It is surrounded by plant roots and saprophytic and mycorrhizal fungi, or “neurons of the earth.” In the drawing are banners—one reads “Compost is alchemy” and another, “Death is the food of life.” Anyone who has plunged their hands into fresh compost, just weeks after turning food scraps over to ravenous worms, knows that this is true. One wonders how many New Yorkers have ever done that.